Fig. 1: Clearly visible as a point of repair is the distal end of the clavicle. Its proximal end cannot be identified. Barely visible is the sternal groove (yellow mark), clearly the medial onset of the sternocleidomastoid (black mark). See also A33. 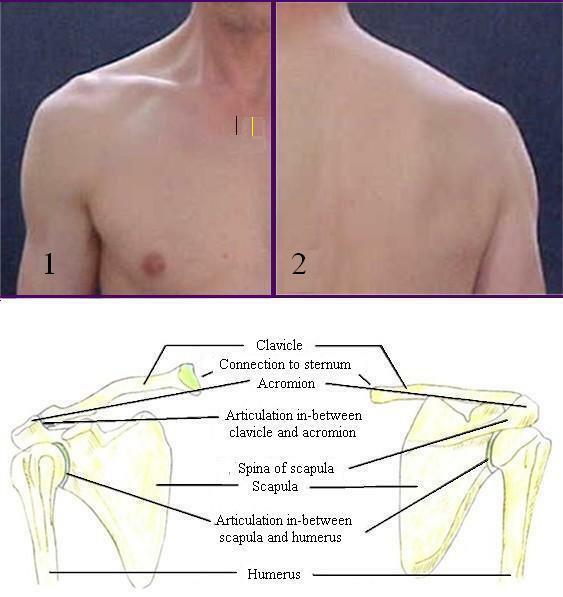 Above the clavicle present in addition trapezius, omohyoideus, below, the clavicular onset of deltoid and pectoralis, distinctly separated from each other by the trigonum deltoideum-pectorale. Fig. 2: In the back view of the shoulder the distal end of the clavicle cannot be identified. Spina of scapula and left border of the scapula present as soft but clearly distinguishable lines.